What defines a reef fish fauna? This debate has tended to focus on the taxonomic structure of reef fish faunas and their history. One emerging conclusion is that present day reef fish did not arise on coral reefs. The taxonomic debate has been influenced by the observation that the most abundant groups of coral reef fishes also have representatives in temperate waters. It may be easier to define reef fishes in terms of their functional attributes and ecological features. The strongest associations with coral reefs are seen in groups such as par-rotfishes, surgeonfishes, butterflyfishes, blennies and many benthic-feeding damselfishes. This association has strong links with their nutritional ecology. reefs. 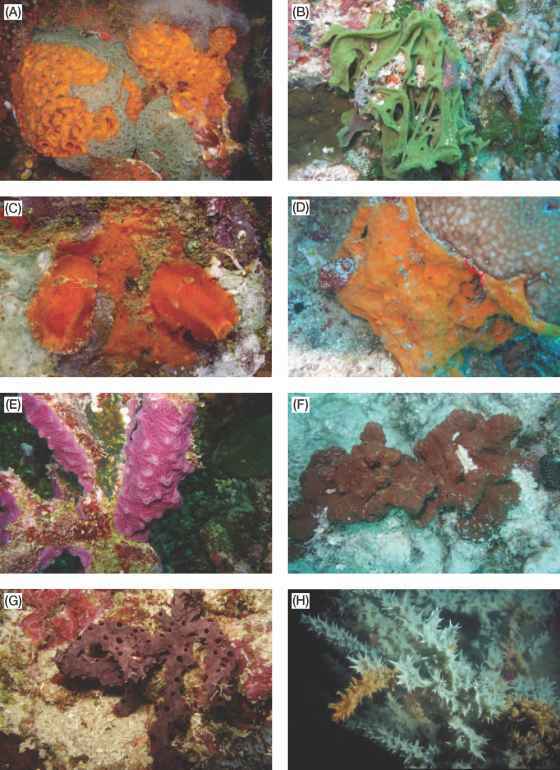 In terms of fish real estate, reefs consist of contrasting areas of complex structure provided by living corals and extensive areas of carbonate rock and associated coral debris. Living corals are used extensively by smaller reef fishes and recruits of larger species as shelter. Extensive carbonate flats and fields of coral rubble support complexes of turfing and encrusting algae, fine sediment and detritus. It is the extensive areas of apparently bare calcareous substratum that provide a key to the diversity and dynamics of many types of reef fishes. If this substratum is examined microscopically then a complex 'tangled bank' harbouring a great variety of small plants and micro-organisms, which (to quote Darwin) are 'different from each other, and dependent upon each other in so complex a manner' is revealed. Very large numbers of fishes graze on this 'bank' with the primary groups being parrotfishes, sur-geonfishes and rabbitfishes (Siganidae). (Fig. 28.4A) or excavating (Fig. 28.4B) oral jaws to extract the microbial assemblages that occur within the porous upper substratum. Many species of surgeonfishes graze mainly on detritus and sediment (Fig. 28.4C). Moreover, analysis of feeding and foraging of smaller fish, including many damselfishes and most blennies, shows that they are also targeting detrital resources. The foraging behaviour of abundant grazing fishes provides a consistent ecological signature for reef fish assemblages. The initial impression is one of uniform feeding by large multispecific schools of grazing fishes moving over tracts of reef. However, both feeding behaviour and the resources targeted are more complex than an initial impression suggests. Some species (exemplified by the aggressive surgeonfish Acanthurus lin-eatus) actively defend territories that support dense growths of turfing algae, their primary food source (Fig. 28.5A). Similar behaviour is exhibited by territorial damselfishes of the genus Stegastes (Fig. 28.5B) where defence of feeding territories against much larger grazers is common. In some reef habitats, such as reef crests, territories may cover up to 70% of the available reef substratum. Other groups of grazing fishes, especially most parrotfishes and many surgeonfishes, form mobile schools that graze over extensive areas, with feeding episodes continuously disrupted by territorial species. that feed on filamentous algae, processing food via acid digestion (Acanthurus lineatus); (2) species that concentrate on large brown algae, through bacterial fermentation (Naso lituratus); (3) species that selectively harvest smaller turfing algae and also use bacterial fermentation (Zebrasoma scopas); (4) species that feed on both algae and plankton (Naso brevirostris, N. vlamingii); (5) species that feed exclusively on detritus (Ctenochae-tus striatus); (6) species that feed on mixtures of detritus, animal matter and algae (Acanthurus blochii); and (7) species that scrape or excavate calcareous surfaces to extract detritus, animal material and turfing algae (Scarus frenatus, Chlorurus microrhinos). All of these groups may combine to form multi-species foraging schools that are frequently joined by rabbitfishes and species of goatfish (Mullidae) and wrasses that forage on small invertebrates disturbed by group feeding. At the upper end of the size spectrum of grazing fishes are the very large excavating parrotfishes (Bolbometopon, Chlorurus) that are capable of removing hundreds of tonnes of solid calcareous material per year and redistributing it as sediment on reef faces. These groups have traditionally been classified as herbivores, placed at the bottom of the food chain and attributed the dual roles of enhancing coral growth through removal of algae and acting as a major conduit of carbon through reef systems by linking plant pro duction to carnivores that consume the abundant herbivorous fish. The removal of algae by grazing fish has been demonstrated experimentally. However, the widespread consumption of bacteria, small invertebrates and a cosmopolitan mix of detrital material demonstrates that food chains and the flow of carbon through coral reef communities are likely to be far more complex than usually considered in trophic schemes. The apparent uniformity of grazing activity in mixed schools masks a much greater diversity of feeding behaviour, dietary targets and food processing than is currently recognised. 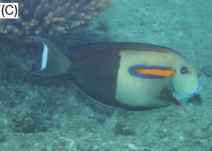 One of the best examples of the diversity of feeding behaviour in 'herbivorous' fishes is provided by an analysis of the evolutionary relationship in the surgeonfish genus Naso (unicorn fishes) carried out using gene sequences extracted from mitochondrial DNA. This provides a means of constructing a robust picture of the evolutionary relations among the 19 currently recognised species. This group is of interest on account of their morphological variation, including slow moving reef grazers and plankton feeders closely associated with shallow reef habitats, often with large frontal horns or head-bumps, to rapidly swimming pelagic tuna-like species. These species have a wide variety of diets including benthic algae, benthic invertebrates, macro-plankton and small rapidly swimming nekton such as small fishes (Fig. 28.6). The unicorn fishes have a long evolutionary history, with closely related genera occurring as well preserved fossils in Eocene (50 My) shallow water marine deposits. The purpose of the evolutionary analysis was to determine the evolutionary pathways of the different feeding modes. Were the herbivorous species basal to the other groups or did they emerge much later? Is plant feeding restricted to certain evolutionary groups? What is the basis of the extraordinary morphological diversity of the unicorn fishes? The answers (Box 28.2) were surprising. A number of well supported monophyletic evolutionary groupings (clades) were identified. The ancestral group was represented by the small, pelagic, fast swimming species of the Naso minor complex, not the more abundant reef associated species. Particular types of feeding behaviour and nutritional ecology (algal grazing, plankton feeding, pelagic foraging on nekton, fermentative digestion) did not occur in cohesive evolutionary groupings but were scattered through the different clades. The trademark morphology of the group, the extended frontal horn, occurred in unrelated species in different clades (e.g. Naso annulatus and Naso brevirostris). This was surprising, as such distinctive morphologies had strongly suggested natural groupings in past studies. The basic message is one of greater evolutionary flexibility in terms of feeding behaviour and morphology than anticipated from ecological studies. In summary, the large groups of grazing fishes that characterise the GBR are deserving of more detailed study.